Camponotus Ant with Cut on Gaster! A week ago I decided to feed my 5 queen ants some honey using several small pieces of tin foil. 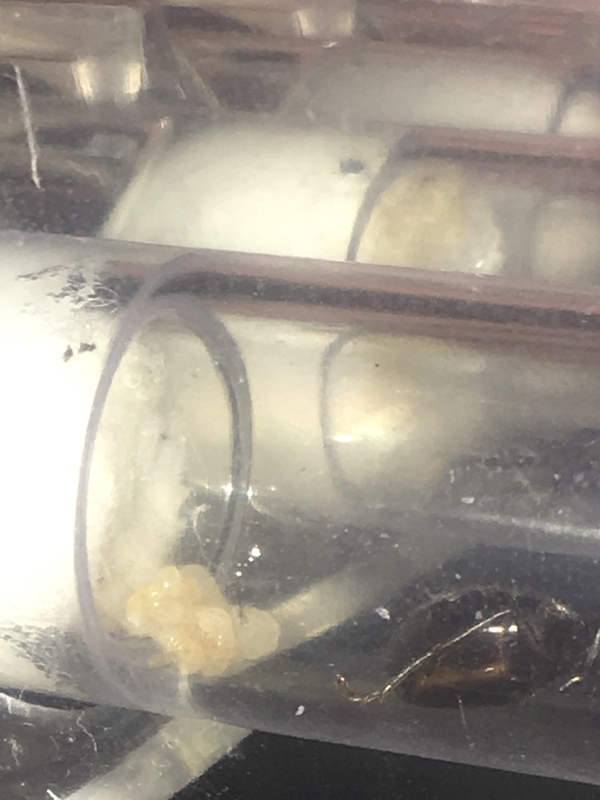 After checking up on them today, I noticed that my oldest queen ant with several larvae had a cut on her gaster! I’ve removed the tin foil and believe that it may have cut her. She seems to be walking around all right and doesn’t seem concerned, but is there anything I should do about it? Re: Camponotus Ant with Cut on Gaster! Sorry I cannot tell 100% if she is cut but I have seen queen with swollen gasters and some sections looked lighter due to stretching. 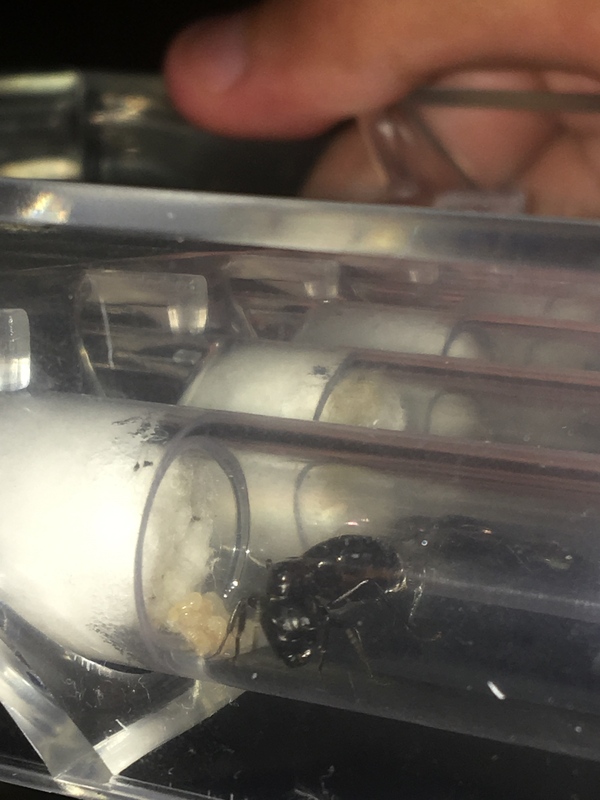 Could this be a possibility for your ant as the eggs form inside? If she seems like its not an issue to her. I would say do nothing so you do not stress her out further. Hope this is useful to you. Thanks for the advice! I’ll check back up on her in a week to see how she’s doing. If it was a cut, would it heal or might it prevent her from laying eggs? Well you have not panicked stating she was acting injured and you can clearly see her checking on her brood before walking off again. If the picture are taken the order they are shown in. I think it is safe to say she will be okay. Also I see loads of people using tinfoil (as we call it) and no one has ever came back with this issue so dont be afraid to use it again. Their exoskeleton is stronger than they look. Best of luck and keep us all up to date? Sorry just had another look at the pics. She has the same mark either side. It is just her gaster. If that was never their before then she has a swollen gaster and that is a good thing from what i have seen and read. She is producing at a healthy rate my friend. I’ll make a post on the Camponotus Journal when anything else interesting happens. I have the same kind of problem and I’m too lazy to write a post, I had my queen in a glass test tube and while trying to transfer her it fell cracked and it cut the queen on her middle body and gasture. They were very small cuts but there was a liquid coming out of both of them but not a lot. I put the queen on a towel and a cup with a hole on top over it and the liquids have stopped coming out of her cuts. Not a lot came out and the only concern she’s showing right now is that she’s can walk but doesn’t push herself all the up like a normal ant would do. She hasn’t been moving either so I feel like she’s saving energy but other than that she SEEMS ok. Does anyone know if those cuts can heal and that she’s probably going to do ok? By any chance would you have a visible picture? This is my issue with glass test tubes because one also broke on me. I had yet to put a queen in it so I changed my mind on the types I used then and there. I am 50-50 on what to do. Monitoring her daily would be worth keeping on eye on the injury but it opens the door to a lot of stress which you really do not want on an injured queen. I am also not sure of the survival rate of ants when injured. 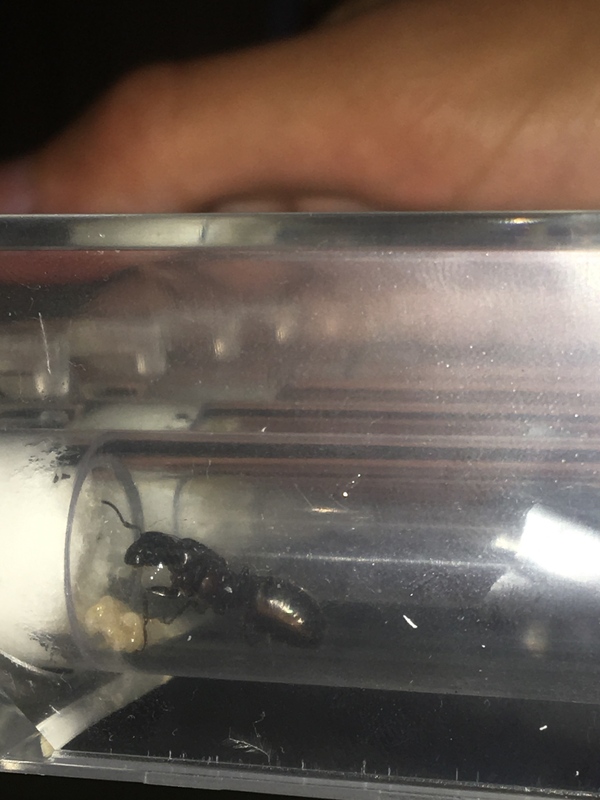 A had 2 injured queen's that I saved from been attacked because they landed occupied areas and the residents did not approve. One sadly died but the other has 2 workers and still has her broken wings (chewed to bits by the defenders) on her body. If you would not mind, please keep us up to date as a dropped tube can happen to even the most experienced keepers. We humans have a clumsy way of life even when we try so hard not to. So it would be more then educational to see how this goes as it will open a door to possible ant nursing or worst case it completely closes that door.